Increases concentration, coordination and cognitive performance. Adaptogen with antioxidant and anti-inflammatory benefits. The red berry of Schizandra chinensis, a plant originating from Northern China, unusually combines the five tastes, hence its Chinese name "wu-wei-zi" ("fruit with five tastes"). ¤ Schizandra nourishes the kidneys: it stimulates adrenal cortical activity and helps combat chronic fatigue by stimulating energy production at its source. It can be used for long periods with no side effects. The fruit of Schizandra Sinensis belongs to the category of astringent tonics. It is used not only to increase strength and physical, intellectual and sexual stamina, but also to treat certain respiratory and digestive conditions. It is an adaptogen that increases the body's ability to withstand stress. ¤ Japanese scientists have shown that two Schizandra lignans (schizandrine and gomisine) have powerful hepato-protective effects, even against compounds as toxic as carbon tetrachloride. Chinese studies show a hepato-protective action against viral hepatitis and alcohol. ¤ In Russia, Schizandra is used to treat fatigue and to improve visual acuity. There are many anecdotal reports of aphrodisiac and nootropic effects which contribute to Schizandra's reputation. 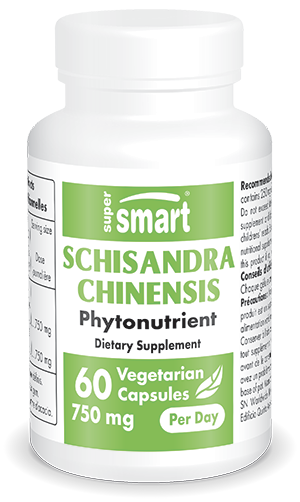 Each vegetarian capsule contains 250 mg 10:1 Schisandra chinensis. Take two capsules twice a day, preferably between meals, or as advised by your therapist.